Yea, they be sticky molecules too. Same with vaping or e-cigarettes (which also have undisclosed fragrance ingredients and emit toxic chemicals). Likewise, if you have an essential oil diffuser, a scented candle, or an air effer (“freshener”) at home or at work, that fragrance will infuse everything in the space with hazardous fragrance molecules that pollute the indoor and outdoor air, and are absorbed in through your skin, and you won’t be fragrance-free. It’s time to read all the labels, look up the disclosed ingredients on EWG’s Skin Deep and Cleaning guides, to get an introductory idea of what is in the products (most fragrance and some other ingredients are not disclosed) and some of the known health effects, and also realize that some of those chemicals are designed to make the fragrance last… and last… and last… (and maybe make you nose-blind so you’ll buy more product too). There are more than enough reasons to go fully fragrance-free! 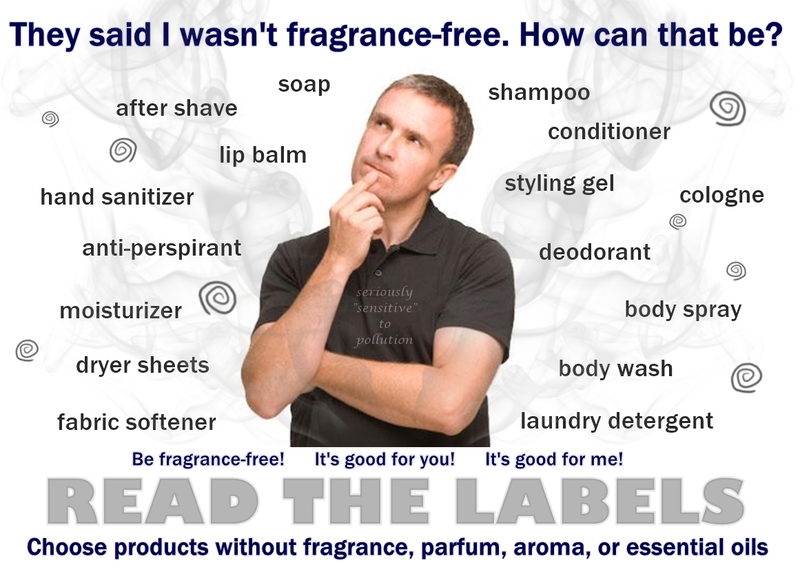 Please remember too, that no-one is asking you to be fragrance-free to make your life difficult or because we think it’s fun to ask people to change things. We’re also asking you to help clear the air for everyone’s benefit! 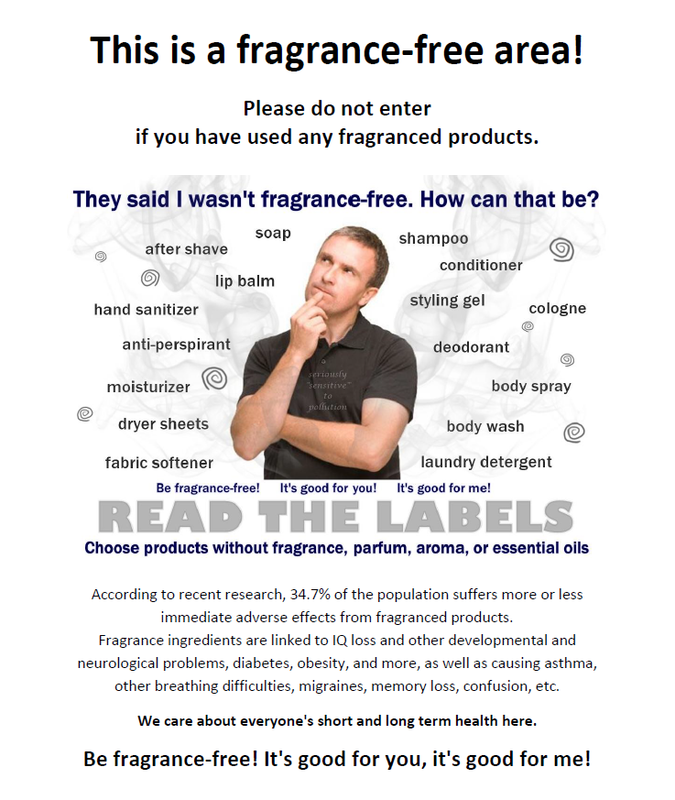 Being fragrance free is good for you! 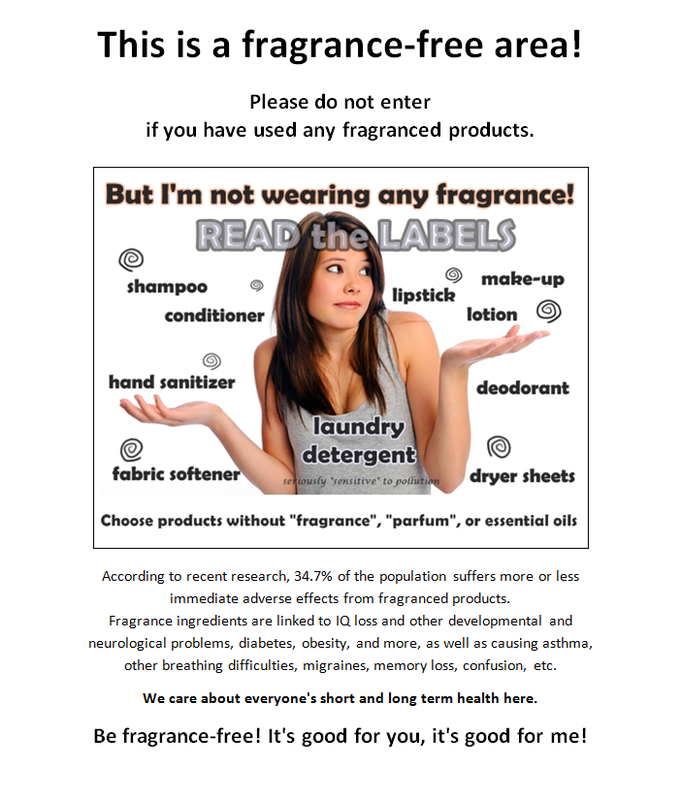 Being fragrance free is good for me! Being fragrance free is good for all living beings! Below are a couple of signs that can be printed and posted. Be aware though that the act of hanging up these signs is not enough to claim you have a policy, if it is not enforced. It becomes wallpaper and can be dangerous to the lives of those who need fragrance-free policies to exist in the world. Please take this at least as seriously as you take peanut-free, gluten-free, smoke-free, and dress code policies. “This is a fragrance-free area” jpeg. This entry was posted in Accessibility, Air Quality, Environmental Health, Fragrance, Human Rights, Policy, Public Health and tagged allergies, asthma, cancer, chemical sensitivity, environmental sensitivities, fragrance chemicals, fragrance-free signs, hazardous air pollutants, IAQ, invisible disabilities, MCS, signs, smoking, VOCs. Bookmark the permalink. As usual, GREAT public service by you! Gratitude, gratitude, gratitude for helping us all to survive in this toxic world. Thanks Terry! I do hope it helps make things easier. It’s so challenging and exhausting to deal with these same issues all the time, year after year after year… and see so many more people adversely impacted, when all this could have been prevented. as usual, you are right & I agree. Just want you to know, I deeply respect & admire your dedication to sharing facts, solid info & your own experience. You are a HERO. “Heather Myers, disposal manager with Island Waste Management, says certain cosmetics and personal care products may contain chemicals or other ingredients that don’t break down and seep into and contaminate the waste and compost streams.